Sometimes there is nothing better than a bad movie. In 1978, brothers Michael and Harry Medved, the former now known as the world's most annoying film critic (excepting Rex Reed), authored a book called "The Golden Turkey Awards," in which the pair dissect the worst films of all time. Some of their picks are questionable in retrospect -- Richard Burton as Worst Actor instead of John Agar??? -- but two of their book's pronouncements have proven immortal. The first is B-movie director Edward D. Wood Jr.'s canonization as the Worst Director of All Time. The second, appropriately enough, is Ed Wood's magnum opus, "Plan 9 From Outer Space," winning the Reader's Choice Award for Worst Movie of All Time. It beat "Exorcist II: The Heretic" by nine votes and trashed such stinkers as "The Swarm," the 1976 remake of "King Kong," "Airport '77" and "Orca." Now, in fact, Wood is not the worst director of all time, nor is "Plan 9 From Outer Space" (1958) the worst film of all time. A better pick for worst director is easily Hal P. Warren, an El Paso, Texas, fertilizer salesman who, for reasons we mere humans can scarcely imagine, was compelled to write, direct and star in "Manos, the Hands of Fate" (1966), which is as good a candidate as any for worst movie. While technically just as incompetent as "Plan 9," "Manos" commits one sin Wood's film doesn't: It's boring. The only way anyone can watch it from beginning to end is by watching the "Mystery Science 3000" version. "Plan 9," on the other hand, is at least always interesting. In fact, I'd make the case that "Plan 9" is actually the best of the 1950s "atomic age" sci-fi films, simply because its moralistic pretensions are so obviously absurd. Compare "Plan 9" to an alleged classic of '50s sci-fi, "The Day The Earth Stood Still" (1951). Both films have a similar premise: Extraterrestrials come to Earth to teach us the error of our violent ways before we become a threat to the rest of the universe. In both films, these "peaceful" aliens threaten to go on a genocidal rampage, killing us all unless we agree to behave ourselves. But there, the similarities end. In "The Day the Earth Stood Still," audiences are subjected to the moralistic speeches of Klaatu (Michael Rennie), an alien who looks like Ward Cleaver and acts like him, too. The film treats him with total respect, not questioning his paternalistic motives. The aliens in "Plan 9," however, are obviously incompetent. Their field commander, Eros (Dudley Manlove), rants and raves about how the people of Earth are idiots with "stupid minds." But the aliens are no better off. After all, their first eight plans to conquer the Earth failed, and plan No. 9, which involves resurrecting the dead to serve as an army against the living, is slow going. By the movie's end, Eros has managed to amass an army of three zombies. I'll take "Plan 9," with all its stunning flaws, over the likes of "The Day the Earth Stood Still" any day. And "Plan 9" has many, many stunning flaws: bad acting, horrible dialog, unnecessary and pompous voice-over narration, bad sets, sloppy editing, etc., etc., etc. "Plan 9" started out as "Vampire's Tomb," which Wood intended as a vehicle for "Dracula" star Bela Lugosi. Lugosi, down on his luck, addicted to morphine and in need of cash, had worked with Wood previously on the films "Glen or Glenda?" and "Bride of the Monster." Wood shot some footage of Lugosi, but Lugosi's death brought an end to the enterprise. It wasn't until later that Wood wrote a new script around the existing Lugosi footage, giving birth to the film he would call his "pride and joy." The resulting film stars former wrestler Tor Johnson, late-night horror movie hostess Vampira, admittedly fraudulent psychic Criswell and one real actor, Gregory Walcott. Wood's wife's chiropractor, hiding his face behind a cape, serves as Lugosi's unlikely stand-in in numerous scenes. "Plan 9" is, however unintentionally, hilarious from beginning to end. 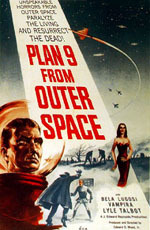 Recommended viewing: "Plan 9 From Outer Space." The latest version on DVD includes the documentary "Flying Saucers Over Hollywood," from which I swiped much of the information above. Also, see Tim Burton's 1994 biopic, "Ed Wood," which is mostly fiction, but is still an enjoyable effort.